There’s girl sh-t, boy sh-t, sibling sh-t, and then there’s Supermodel Sh-t.
We don’t get it often, mostly because the real supermodels don’t give a lot of interviews. But when it happens it’s glorious because their shade has been honed in an industry that values judgyness and c-ntiness (see: Tom Ford, Anna Wintour, Karl Lagerfeld). Plus there’s all that suppressed hanger. Everyone knows about Naomi Campbell and Tyra Banks’s feud, mostly because Tyra brings it up every year or so. The story goes: Tyra went to Paris to model, Naomi was already on top, and there was an instant rivalry fueled by the industry’s unspoken “one black model per shoot/runway” rule at the time. Tyra said Naomi sabotaged her, got her fired from shows and basically made her life a living hell. Tyra gave up runway and moved onto a very successful swimsuit/Victoria’s Secret career (not to mention her post-modeling empire). It’s been 10 years since the story came to head on, what else?, Tyra’s talk show. This was an instant classic – you can feel Tyra relishing the control she finally has over her perceived rival. The empty studio audience (because it would be “too emotional” for Tyra), the pursed lips, the surpressed eye rolls. This is 42 minutes of Naomi basically saying “I don’t know her” with her face. Did you ever know Gianna Versace????????? Hahahahahahahaha. Of course it ends in tears and hugs, but did we think that Tyra and Naomi really forged a friendship after that? That they genuinely like one another? They have posed for photos together at award shows, but friends? Click here if you’ve never watched that episode. "It wasn't fair to Naomi. ... To this day, I'm very scared of her," Banks continued of her 46-year-old former rival. "I don't want to go too deep into the past, but it was very difficult — like some of the lowest times in my life — dealing with that. I don't condone her actions and her response, but I understand where it comes from because the world is saying, 'You're not going to have your spot. We're going to take your money, we're going to take your fame. Go sit down, there's somebody else.'" Tyra is being magnanimous by saying she felt bad for Naomi. She pities her because when Tyra stepped on the scene, Naomi was pretty much done. They put Baby in the corner. So Naomi responded the only way she knew how – by going nuclear. No doubt competition between the two was heightened because there was far less opportunity for models of colour, but that’s not what Tyra is saying. She’s implying that she could have snatched Naomi’s crown – everyone said so! – but instead she chose to step away from all the drama, allowing Naomi to reign without competition. That’s some grade A shade from the self-appointed supermodel beef squasher. Tyra is the one who put on her “Mayor of Modeland” hat in playing peacemaker between the old (Stephanie Seymour, Rebecca Romijn) and new (Gigi Hadid, Kendall Jenner) guard to emphasize that the up-and-comers are supermodels, just not the kind old people (30+) remember. This all ties into a new interview Hailey Baldwin in Harper’s Bazaar Australia, in which she talks about how the young kids like totally have respect for the oldies. “The older supermodels sometimes don't agree with the fact there is a new generation of models. We're not saying we're supermodels. I'd rather people look at us as businesspeople, and, yes, modeling is our business right now, but we're not trying to take anybody's spot, and we're not trying to discredit the past." Here is where I need to get out my encyclopedia and cordless phone because clearly my age is showing. Hailey Baldwin a supermodel? What’s that now? I’m not a Millennial Supermodel Denier. Gigi, Kendall, Cara, an argument could be made for any of them. But by pulling out that “we”, Hailey is putting her career on the same level as them and acting like she speaks for groups like the Instagirls and the new Brat Pack. So the whole “we’re not saying we’re supermodels” line accomplishes two things: it tells people that she’s considered a supermodel but just too humble to say it about herself, and it puts her in company with other supermodels. But the core problem persists: Hailey is not at the level of Gigi or Kendall. 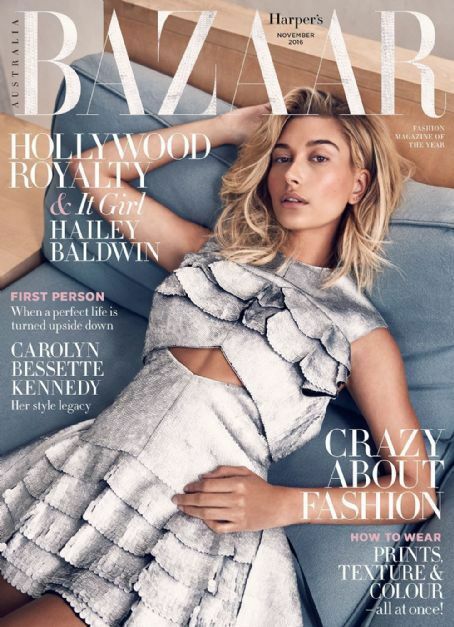 She has her last name and her whatever relationship with Bieber going for her (which wouldn’t help her book jobs, but certainly helps with press), but when journalists ask OG supermodels about the new crop of girls, is anyone thinking of Hailey Baldwin? Hailey also said she’s been told she will never be as big as Kate Moss. Well Kate Moss is one of the most successful fashion models ever. Like in the history of the world. It’s not exactly an insult to say someone will not reach the top .0001% of their field, is it? Why would she think she would be Kate Moss, a once-in-a-generation model? This isn’t a knock on where she’s at in her career. She’s 19! She gets paid to travel the world and wear designer clothes. She’s approaching 8 million Instagram followers. But this whole reverse-psychology “don’t call me a supermodel” and “I’m not the next Kate Moss” humblebragging is lame. The day she bounces back from a coke scandal with 3 major covers in a row (W, Vanity Fair, French Vogue) or has an industry feud that lasts two decades, she can start comparing her career to one of the greats. Until then, keep reaching for those Likes.